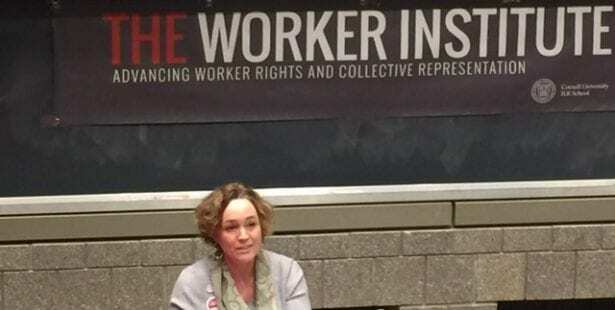 “Collective action is the antidote to injustice,” said Bader-Blau during her keynote speech, “On Our Terms: How We Redefine Democracy and Reverse Exploitation through Social Justice Global Unionism,” at the School of Industrial and Labor Relations (ILR) at Cornell University in Ithaca, New York, last week. Bader-Blau spoke to about 100 Cornell students, faculty and the general public in her role as ILR’s 2019 Alice B. Grant Labor Leader in Residence—a multifaceted program that recognizes U.S. and global labor leaders and brings them into Cornell classrooms and the public stage to share their knowledge and expertise. During her time at Cornell—sponsored by the ILR Worker Institute as part of the university’s 2019 Union Days program—Bader-Blau met with students, student labor organizations, ILR and other university faculty, and visited the Tompkins County Workers’ Center (TCWC) in downtown Ithaca. The challenges Bader-Blau described “are ones that our students will confront as they study and think about how to shape the future of work and labor,” said Alexander Colvin, ILR Interim Dean and Martin F. Scheinman Professor of Conflict Resolution. Each year, Cornell’s ILR Worker Institute invites a union activist to visit as the Alice B. Grant Labor Leader in Residence to give ILR students the opportunity to learn from the knowledge and experience of labor leaders who reflect the diversity of the labor movement. The ILR School of Cornell University is focused on work, employment and labor policy issues through teaching, research and advocacy outreach. Previous Alice B. Grant Labor Leaders in Residence include AFL-CIO President Richard Trumka, AFL-CIO Executive Vice President Tefere Gebre, American Federation of Teachers (AFT) President Randi Weingarten, former Pride at Work Co-President Nancy Wohlforth and former Congress of South Africa Trade Unions (COSATU) Regional Secretary Tony Ehrenreich. Bader-Blau’s presentation was sponsored by the ILR’s Worker Institute and co-sponsored by the People’s Organizing Collective (POC), Cornell Organization for Labor Action (COLA), ILR Graduate Student Association (ILR GSA), Catherwood Library, Cornell’s Law & Society Minor, Undergraduate Labor Institute, ILR Office of Career Services, ILR Office of Student Services, Cornell Farmworker Program and the TCWC.